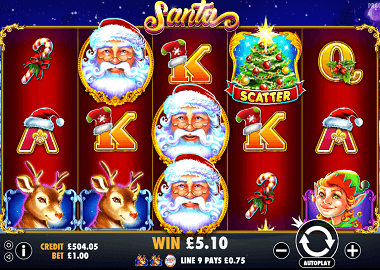 The Santa Slot is a five reels slot with three rows and 20 paylines. The Christmas themed slot is playable on all devices including iOS and Android Smart Phones. Starting at 20p up to £100 you can spin the reels and win 4 different jackpots. There is also a Free Spins feature where you can get bigger profits with 5 Free Spins and Santa Full Reel Symbols. Pragmatic Play developed a fantastic Christmas online game! With the Santa Slot, there are gifts and surprises throughout the year. Symbols & Payouts: The symbols of the Santa Slot are in a cartoon style and include playing cards symbols and Christmas symbols. The playing cards symbols are the low paying symbols. The themes icons are candy canes, bells and a reindeer. The best payouts you get with Santa’s eleven. Here you can win 20x your bet on an active payline for 5 identical symbols. In addition to two scatter symbols, Christmas Tree and Gift Box, there is also a wild symbol. This is Santa himself and replaces all other symbols except Scatter or Jackpot symbols. Bonus Game feature: The Bonus Game feature is the first of two bonus features. With these you can win 4 different jackpots. To trigger the bonus game you need 3 gifts box symbols on reels 1, 3 and 5. Then a new screen will open and you can see 12 presents. Open the presents until you find a jackpot icon. There are 4 different jackpots: Mini (10x win of your stake), Minor (25x), Major (50x) and the Grand Jackpot. For this you win 250x your stake. Free Spins feature: The Free Spins feature is the highlight of the Santa Slot. You have to land 3 Christmas Tree Scatters on your reels to trigger it. You then get an instant win and 5 free spins. A new screen with other reels will open afterwards. The Santa Wild symbol plays the biggest role here. It can land as a stacked full reel symbol on reels 2, 3, 4 and 5. You can then play 5 free spins with up to 4 wild reels, which generate huge winnings. Pragmatic Play has developed a wonderful Christmas slot. The Free Spins feature is very exciting because with several Wild Reels you can win pretty good prizes even with small bets. You can play the Santa slot for free by clicking on the top of the Santa banner. More about Pragmatic Play Casinos and even more Free Slots can you find here. Our best Pragmatic Play casinos are Guts Casino and Rizk Casino. In both casinos you get Playn’Go Free Spins when you register.